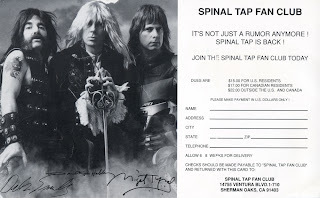 Business travel keeps me from making a substantive post today, but I do have time to pause and ask of you, how could you not have signed up for the Spinal Tap Fan Club in 1992 when the world's loudest band resurfaced to support its then-new album, Break Like The Wind? Depicted above, and below, are the front and back of an interest post card sent by the club 15 years ago. Early that year, Nigel Tufnel, David St. Hubbins, and Derek Smalls triumphantly returned to popular culture after a multi-year absence that began following the release of 1984's This is Spinal Tap, the mockumentary which introduced the band to the world. We're sorry it took so long to get back to you but we've been quite busy lately. What with rehearsing for our upcoming tour and trying to straighten out our tangled legal problems. Oh, well! We love hearing from you so please stay in touch. Fifteen years after that, in 2007, the band would reunite again to play Live Earth. 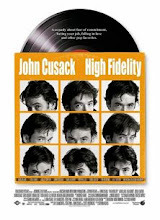 This means, of course, that since 1984 they have been together, played more significant gigs, and garnered more attention than many "real" bands. Ah, parody.